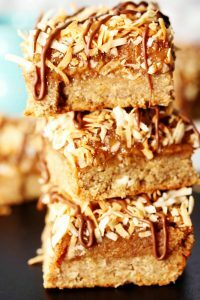 These coconut almond bars with a high protein chocolate frosting are quick to make and don’t require baking! 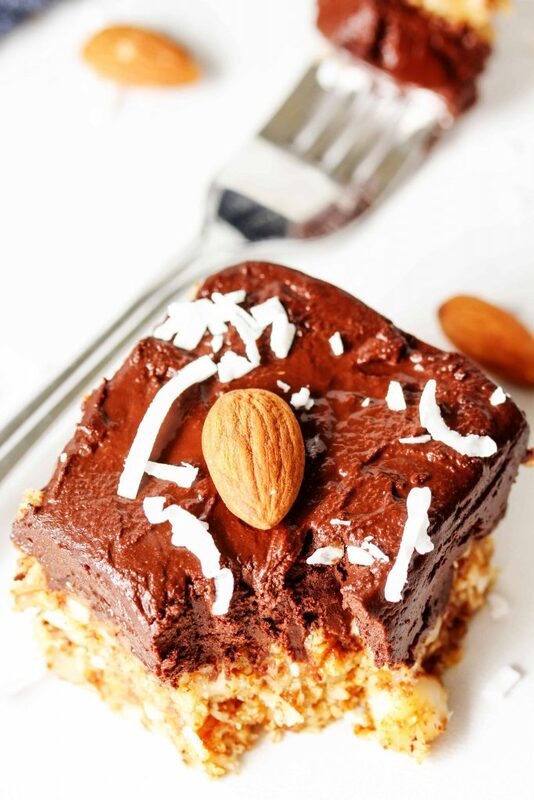 They consists of an oat, coconut, almond base with a high protein, creamy, chocolate frosting. As good as the two are together, I could literally eat just the frosting by the spoonful! The weather this weekend was perfect for staying inside and binge watching TV. It went from over 80 degrees and sunny on Saturday to cold, gloomy, rainy, and about 55 degrees on Sunday. My TV was glued to Food Network and all the competition cooking shows they run on the weekends. Anyone else love those shows? I love the baking ones the most (no surprise, right?). They always have some weird ingredient that has to be incorporated into the dish/dessert. In a particular Cupcake Wars episode they had to incorporate fish into their cupcakes. The goal is to make a cupcake where the fish flavor is prominent, since that’s the secret ingredient, after all. So, 1. Ewwwwwww, no thanks. And 2. It made me realize my blog’s whole purpose is to basically do the exact opposite of that. 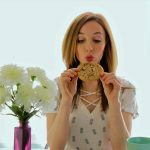 I like to take a nutritious ingredient that you wouldn’t normally use in a dessert, but disguise it so that you get all its health benefits, but not really any of the flavor you’d expect from it. The chocolate frosting in these Healthy Chocolate Fudge Rounds Cookies doesn’t taste anything like guacamole, but it sure does have avocados in it! 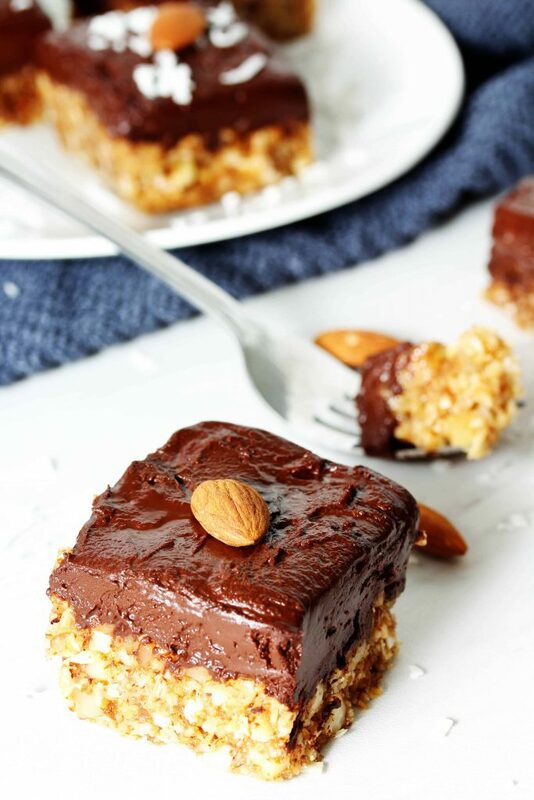 And, no, these Healthy Chocolate Hazelnut Brownies don’t taste like hummus, but they are made with chickpeas! Hey, Food Network, I have an idea for a new show for ya . 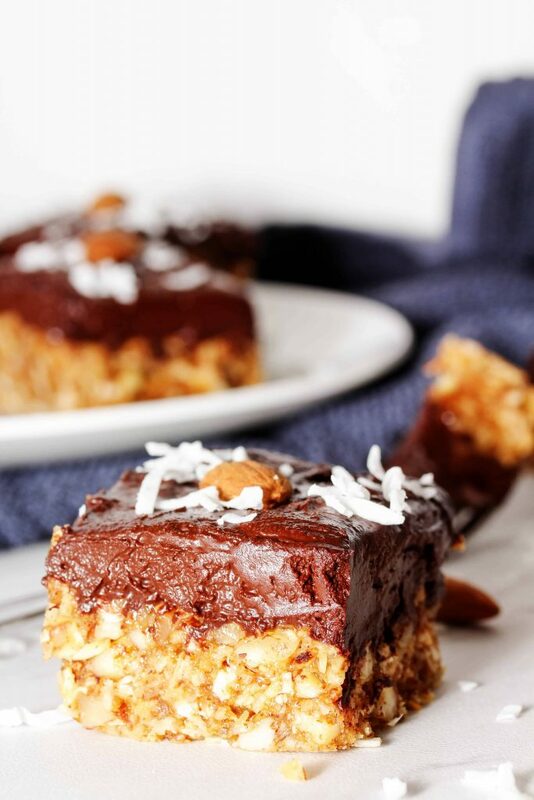 But, enough of my new found career in developing TV shows and onto these chewy, coconut-y, almond joy-esque bars with a creamy, high protein, chocolate frosting. Yes, you read that right. High. Protein. Chocolate. Frosting. 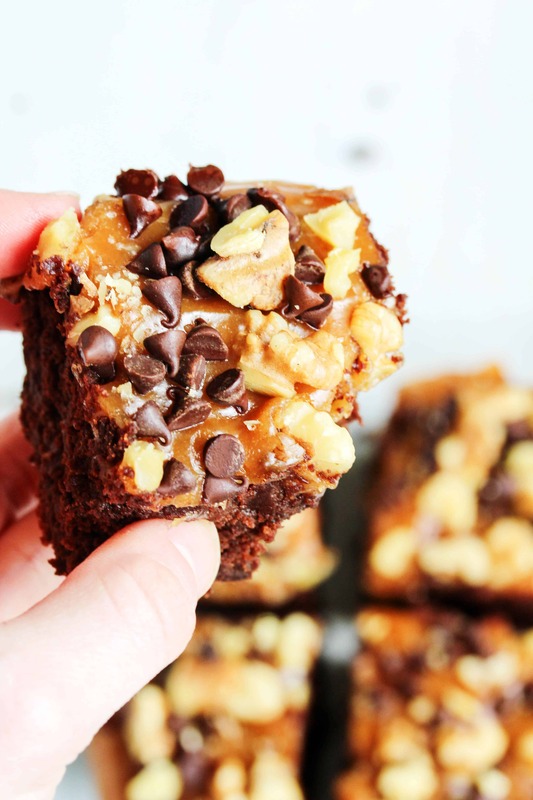 You will basically want to eat it all straight off the spoon, but try and save some for the bars. 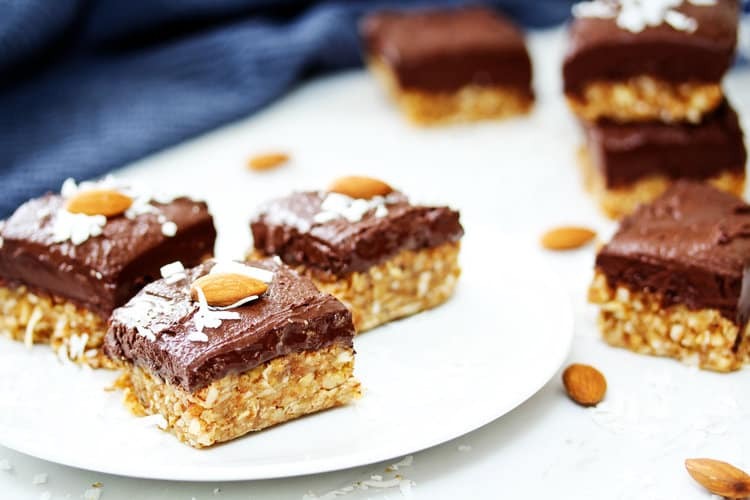 And, after my whole declaration that I have a great idea for a new TV series on how to mask the flavor of nutritious, not-typically dessert-y foods, these coconut almond bars with chocolate frosting are actually pretty normal and simple in their ingredients list. 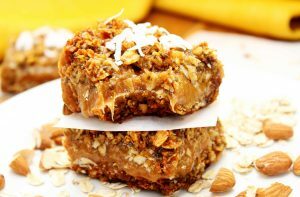 The base of these bars are loaded with fiber and heart healthy fats (the kind that help raise your good cholesterol!) thanks to the oats and almonds. But, what good is that if they don’t taste good? No worries here! 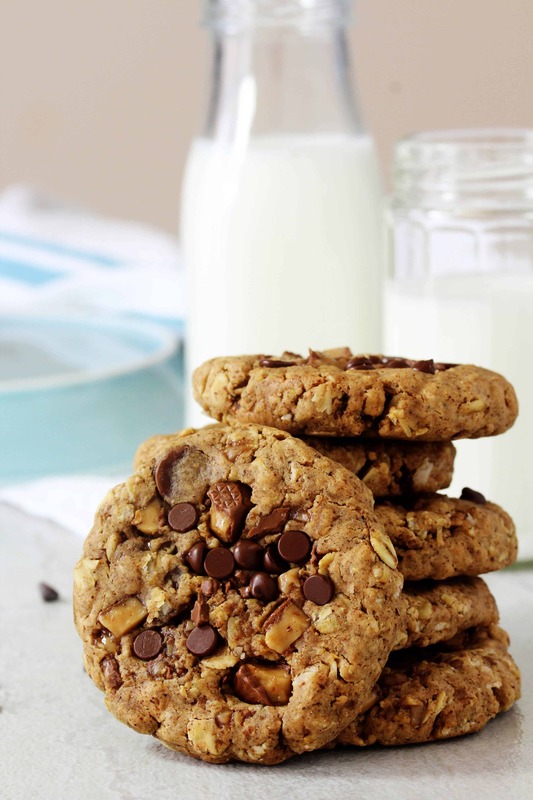 They are sweet, chewy, and have a hint of crunch thanks to the chopped almonds. They would even be great all by themselves! But, if there is one thing that makes everything it touches better, it’s CHOCOLATE! 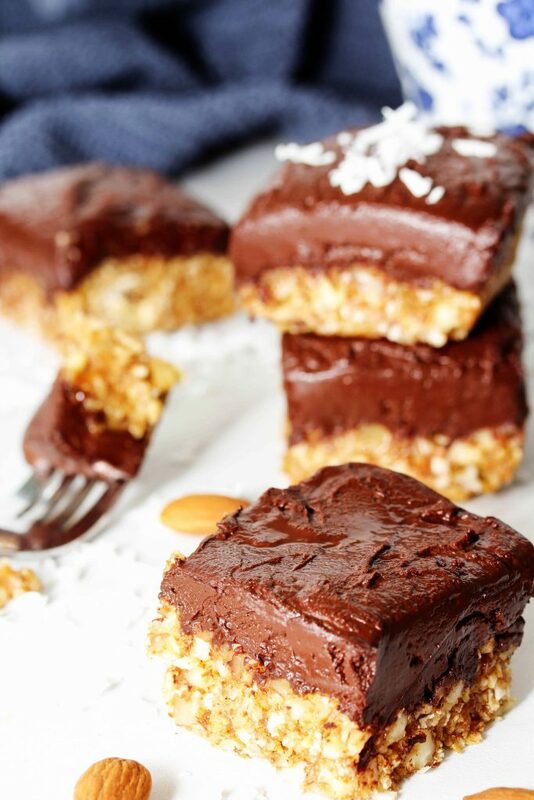 So, our chewy granola bar-esque base is getting slathered with a high protein, super simple chocolate frosting. Dreams do come true! This frosting is smooth and rich and makes you want to eat it straight out of the bowl. 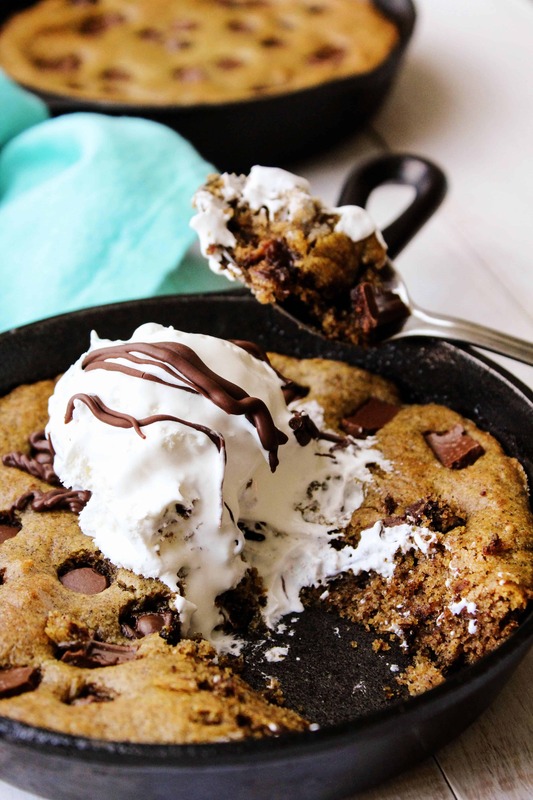 So, if any actually does make it to your bars, congratulate yourself on having the determination and self control not to devour any and all things chocolate immediately . So, don’t walk, RUN to the kitchen and whip up a batch! And, when you do, be sure to tag me @HealthyHacksRD so I can see your creations! 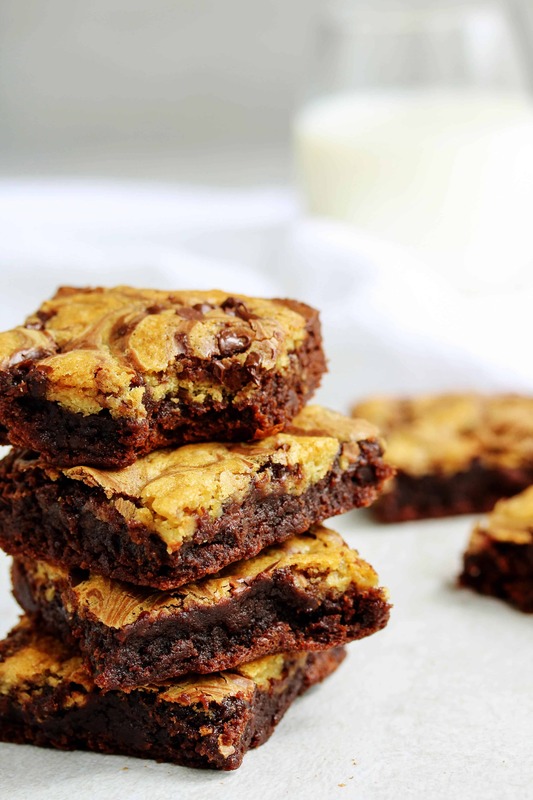 But, if you can’t make them right now, be sure to click the pic below to Pin the recipe for later! For the crust: in a food processor (or blender), add the almonds and oats. Process for a few pulses, just until chopped slightly (you don't want them to be a flour consistency). 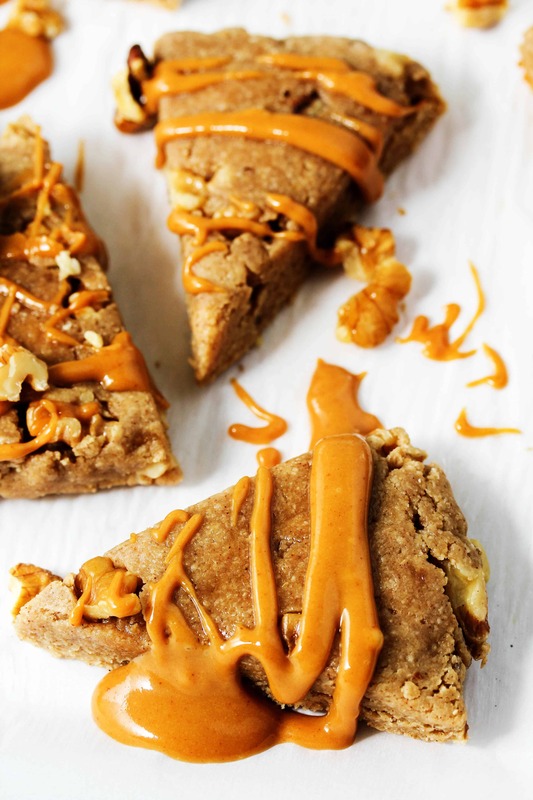 To a medium bowl, add the chopped almonds and oats, almond butter, coconut, honey, water, vanilla extract, and salt. Stir until everything is combined and sticking together. Transfer the mixture to the prepared loaf pan. Using your hands or the back of a spoon, press the crust out evenly. 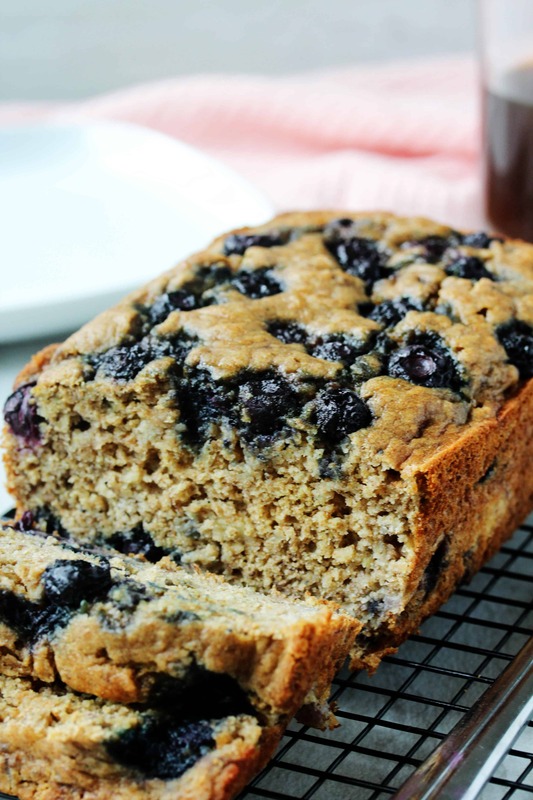 Place it in the fridge to firm up - about 1-2 hours. For the frosting: once the crust is firm, add the cocoa, protein powder, agave, water, vanilla extract, and salt in a medium sized bowl. Stir until everything is well combined. At first, it might look like nothing is happening and the cocoa isn't incorporating, but keep stirring and it will all come together! Spread the frosting out evenly over the crust. Place back in the fridge to firm up a bit - about 30 min. 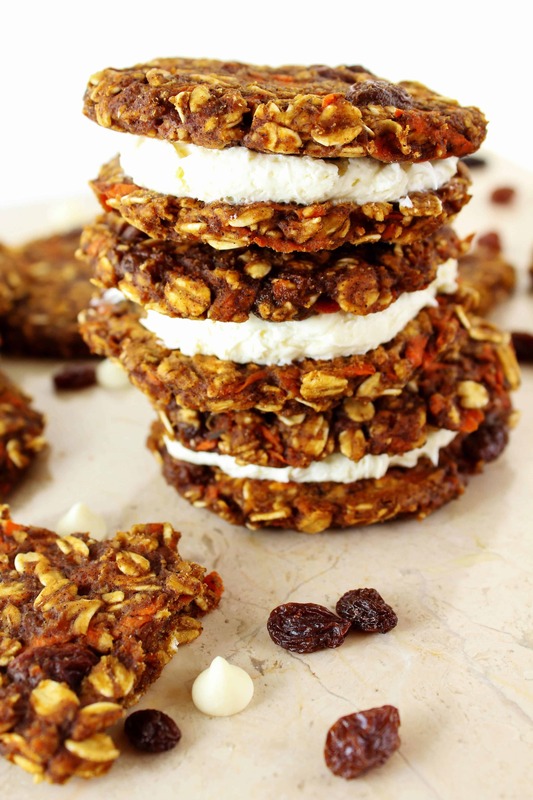 Slice them up to your desired sized squares and start snacking! Prep time doesn't include refrigeration time.